I just got it in the mail today and I love it. I was the ‘st ends’ in this BFF relationship(I love ya Kristy)! What girl didn’t have this necklace growing up in the 80s? And then, when James and I were dating, he gave me this James Avery necklace on my 19th birthday and I wore it pretty much everyday until I had Rilyn! But I’m braver now, and ready to take on another necklace! 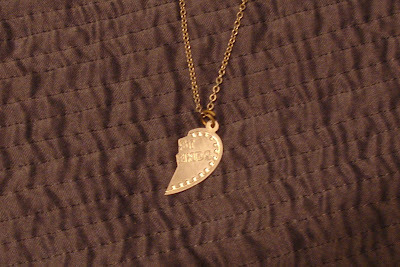 Oh, what good memories of the best friends necklace! Since I teach jr. high, I still see them a lot, and I always ask the girls “Who has your other half?” What fun memories we share!